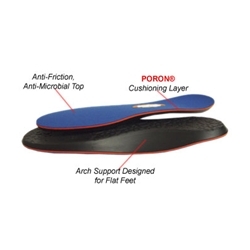 Poron® layer cushions during activities and the anti-friction/anti-microbial cover keeps your feet cool, dry and odor free! Special Note: Each insole has the Men's and Women's Sizing imprinted on the bottom. DIABETICS: If you are a diabetic with flat feet, do not wear this insole.